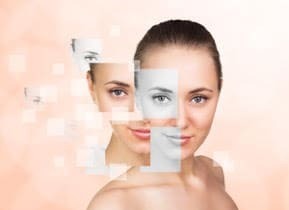 While rosacea and acne are common indicators that you have sensitive skin, other signs can include a feeling of discomfort and/or inflammation following stimulation or the application of a product. While inflammation can range from mild to moderate redness and/or acne, some individuals might also experience itching, uncomfortable hives and/or an outbreak of pustules. Sensitive skin can be caused by a number of things, including natural aging. As hormones and the efficiency of the skin’s barrier decline, dehydration and dryness ensue. Essential Fatty Acid deficiencies and dietary sensitivities such as those experienced with Gluten and Dairy can often add to the problem. How do I restore balance to my sensitive skin? Natural aging, exposure to harsh elements (wind, snow, heat, sun) and environmental toxins can leave the skin looking and feeling stressed. Skin experts at Clarity Medspa in Toronto feel it is vitally important that one use products formulated and tested to treat sensitive skin. “A favourite with our clients is the Ultra Soothing Collection, by Eve Taylor™. Not only do these products calm and nourish, they help address dehydration and inflammation”, says Chantal Ward, RN. Skin care formulated with key ingredients that attract moisture, calm inflammation & soothe irritation. Colloidal Oatmeal – contains a component called Beta-Glucan, which, when mixed with water, leaves a milky residue on the skin that attracts moisture from the atmosphere to itself, and provides a protective barrier, preventing the evaporation of water. Camellia Oil – Considered a nutrient-rich “Superfood” for the skin, Camellia oil contains Oleic Acid, Vitamins A, B, D, E and Omegas 3, 6 and 9. With these essential fatty acids, the receptors which cause the inflammation are soothed immediately, and the inflammation is reduced at the source. Aloe Vera – Known for its deeply soothing properties.Provides natural hydration and nourishment, along with anti-oxidant protection. How can Facial Cupping combined with Magnetic Infusion help my skin?